Mount Prospect Public Library Consumed by Basketball? Are you enjoying March Madness? 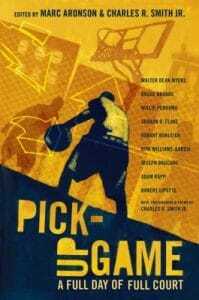 Want to find a novel that centers on basketball? Check out our list below! Fifteen-year-old Drew “True” Robinson loves being the best point-guard prospect in high school basketball, but learns the consequences of fame through a former player, as well as through the man who expects to be his manager when True reaches the NBA. The Pick-Up Game: a full day of full court edited by Marc Aronson and Charles R. Smith Jr.
A series of short stories by such authors as Walter Dean Myers, Rita Williams-Garcia, and Joseph Bruchac, interspersed with poems and photographs, provides different perspectives on a game of streetball played one steamy July day at the West 4th Street court in New York City known as The Cage. In 1923, in Pierre, Indiana, fourteen-year-old Andy realizes a dream when he makes the high school basketball team, but when an accident keeps him from playing, he ventures into journalism and begins to understand the meaning of sportsmanship. High school sophomore Liam jeopardizes his new position on the varsity basketball team when he decides to take a stand against his coach who is leading prayers before games and enforcing teamwide participation. Fifteen-year-old Alyx Atlas starts school in a new state with a new identity–as a girl in Milwaukee–but a bully on the basketball court threatens to reveal that Alyx is an intersex person, which could disqualify Alyx and the team from playing in the state championship game. Thirteen-year-old Savvy Christopher is 6’2″ and a talented basketball player; her big sis, Callie, is a cheerleader. When an injury ruins their dad’s golf career, the family moves from their swanky New Mexico home to an aunt’s sheep farm in Rhode Island. Savvy is thrilled when she makes the exclusive 18-and-under basketball team The Fire; getting to play on a great travel team makes up for having to share a room with Callie, being teased about her height, and having to work on the sheep farm. But when steroids are found in Savvy’s gym bag, she’ll have to fight for her spot on the team. Seventeen-year-old “Slam” Harris is counting on his basketball talents to get him out of the inner city and give him a chance to succeed in life, but his coach sees things differently. Seventeen-year-old Sticky lives for basketball and plays at school and at the Lincoln Rec Center in Los Angeles but he is unaware of the many dangers–including his own past–that threaten his dream of playing professionally. Finley, an unnaturally quiet boy who is the only white player on his high school’s varsity basketball team, lives in a dismal Pennsylvania town that is ruled by the Irish mob, and when his coach asks him to mentor a troubled African American student who has transferred there from an elite private school in California, he finds that they have a lot in common in spite of their apparent differences. Four players at the Final Four of the NCAA basketball tournament struggle with the pressures of tournament play and the expectations of society at large. When he and his high-school basketball teammates steal from a fraternity house in their small Indiana town, Nate contends with his guilt, his loyalty to his friends, and his desire to help his older brother who comes under suspicion for the crime.